I have always enjoyed reading Penny Ur's books about language teaching. 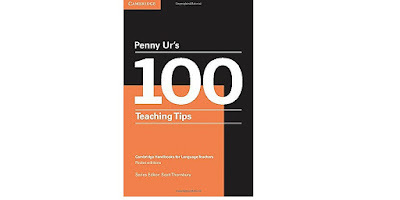 Penny is well-known in the field of English language teaching (EFL) and has recently retired from full-time teaching. This slim volume, part of the Cambridge Handbooks for Language Teachers, is rich in wisdom, expressed in an informal and lucid fashion. 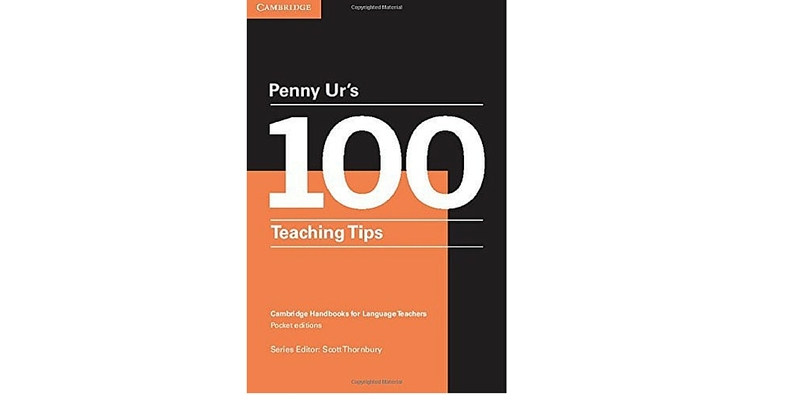 The 100 tips, one per page, are divided into 18 sections, covering topics such as: starts and ends, using coursebooks, games, grammar, group work, discipline, homework, listening, pronunciation and teacher talk. Penny is at pains to say that she is not prescriptive about the points she makes, but almost everything she writes makes great sense to me as a fellow teacher of long experience. She is clearly a methodological pragmatist, noting, for instance, that you need not be dogmatic about target language use - translating a word can be far more efficient that spending ages trying to explain it with definitions and synonyms. "When I started teaching I was told: 'Don't bother about teaching vocabulary, they'll pick it up, grammatical patterns are the priority' (this was the heyday of audio-lingualism). Big mistake! Huge!" I can identify with that, no doubt having emerged as a teacher in a similar era. Incidentally, as far as vocabulary is concerned, she mentions the importance of teaching chunks of language, not juts isolated words. She also argues that you sometimes have to teach words out of context. For example, she writes that if you simply write up a word on the board, pronounce it clearly, explain and translate it, students are more likely to remember it than if you just deal with it more briefly in context. This is an example of a teacher having learned through experience that there is no one way to teach a language and you should be wary of dogmatism. This book is packed with little 'tips of the trade' which should be of interest to both new teachers and those with experience. Don't worry that Penny's background in EFL; almost all the advice holds true for modern language teachers. "Your main source of expertise has to be your own experience and experimenting - the more the better - supplemented by student feedback and discussions with colleagues or interactions with other teachers at conferences or online." Penny concludes by saying that teaching should be fun and leave you with a 'smiley' feeling. Doing your own thing should help you achieve this. This little book is excellent. It would be a super addition to your departmental library. If you are interested, here is Penny Ur talking about her book, which is published by Cambridge and costs £8.99 from Amazon. ���������� when I went to teacher training college, we were told on the first day that we were now teacher. I now wonder why I bother d with the rest of the year. Grammar was out. Speaking 100% target language was in. And were shown a video of a primary school teacher holding up flashcards and mispronouncing French words like grenouille..and told this was how to do it. We also had the dreaded microteaching which was about preparing a ten minute mini lesson for the tutor to tear apart....what a pointlesss waste of time......how about actually teaching us something!! But no...endless poking in the dark...I reckon the lecturers only knew how to tell us how crap we were and had no idea how to teach themselves......there....I've said it....after 25 years!!! You said it! I was trained at the West London Institute as it was called then (Maria Grey College and Borough Road). It was a solid introduction to the question-answer direct method approach. It stood me in pretty good stead.